Why Do Penguins Live in Antarctica at the South Pole and Not in the Arctic at the North Pole? Penguins don’t live in the Arctic because they don’t like having to swim across warm water. They are perfectly happy where they are, however, you’d be surprised how far north they can go. There are colonies in Australia and New Zealand, as well as at the southern tips of South America and Africa. But the surprising thing is that a small colony of a few hundred penguins also exists far afield in the Galapagos Islands, which is pretty close to the equator. The Galapagos penguins probably got washed there by the frigid Humboldt Current, which runs along the western coast of South America; the cold current keeps them happy despite the unbearably tropical climate. What would happen, though, if we got a cargo ship full of ice and went to Antarctica, filled the ship with penguins, and transported several thousand to the Arctic? Would they survive and thrive? Scientists say penguins would probably not survive in the Arctic. For one thing, they would have to adapt to a place that contains none of the landmarks they use to establish their breeding grounds and the like. For another, they don’t defend themselves and their young well. 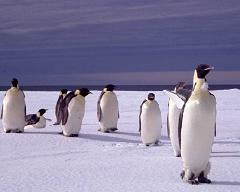 The reason they thrive so well in the Antarctic is because there are no land-based predators to disrupt their nesting. Odds are that penguins would provide cheap protein to polar bears and arctic wolves for a year or two until their numbers dwindled to the point that they could no longer survive. How Cold Does It Get In Antarctica and Why Is Antarctica Colder Than the Arctic In the North Pole? How Cold Is the South Pole and Why Is It Colder At the South Pole Than At the North Pole? How Much Life Does the Artic Have Compared to Antarctica and Is the Arctic Barren Like Antarctica?